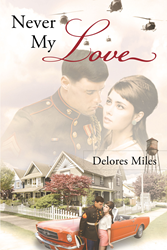 Recent release “Never My Love” from Page Publishing author Delores Miles is the heartwarming story of youthful love that never subsides. Delores Miles, an educator and author, has completed her new book “Never My Love”: the sweet story of a once in a lifetime childhood love that stands the test of time. A love that evolves, “Never My Love” tells the story of two young people committed to one another over time and the very notion of love itself. Their journey allows the reader to experience the magic of a love most never experience in their lifetime. As they grew up on different sides of the tracks, Jake and Annie’s love faces unsurpassable odds. Years change their lives but never their hearts. Yet, they never let go of that once in a lifetime love they found during the summer of 1963. Published by New York City-based Page Publishing, Delores Miles’ tender story of young love that only few have had the pleasure of experiencing. Readers who wish to experience this romance story can purchase “Never My Love” at bookstores everywhere, or online at the Apple iTunes store, Amazon, Google Play or Barnes and Noble.